***For a limited time, you can get the author’s latest book, The Yin & Yang Lifestyle Guide, for free - click here to find out more > michaelhetherington.com.au/freebook (just copy and paste into your browser)*** Your Little Guide to Motivation, Inspiration and Success!There are two types of people in this world: The first type of person is a person who is walking their path, and because of this they are now inspiring others and helping others to find their path. The other type of person is a person who is lost, confused, and still looking for their path. Which one are you? The path is unique to every individual in its form, yet it seems that many of the qualities of the path have similar characteristics. 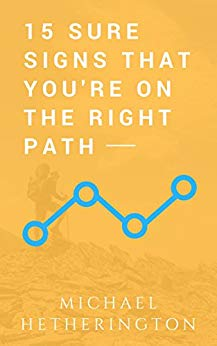 The 15 signs listed in this book aim to clarify the most common characteristics found on the path. This book can help you to clarify- your career path- your mindset and approach- your sources of inspiration and motivationThe purpose of this book is to help direct you towards your path or for those of you who have already discovered it, this book will surely give you a little extra kick of confidence so that you may continue to walk on it.When we walk on our path of joy, all beings, including ourselves will benefit.